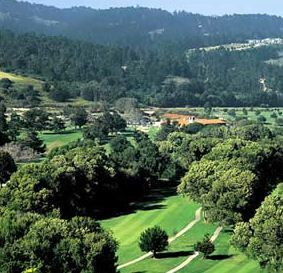 Del Monte Golf Course, is a Resort, 18 hole golf course located in Monterey, California. Del Monte Golf Course opened for play on May 1, 1897. The course was designed by Charles Maud. 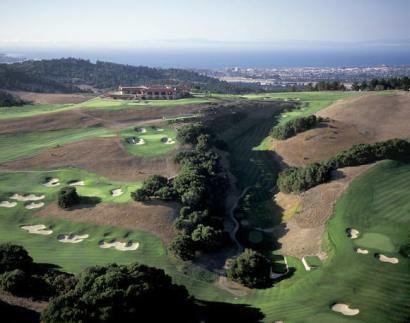 In 1903 Del Monte was expanded to become one of the first 18-hole golf courses in California. It was built partly to provide a diversion for guests of the original Hotel Del Monte, now the Naval Postgraduate School. 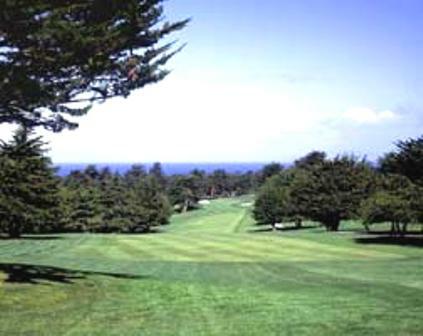 The Del Monte is the oldest course in continuous operation west of the Mississippi. 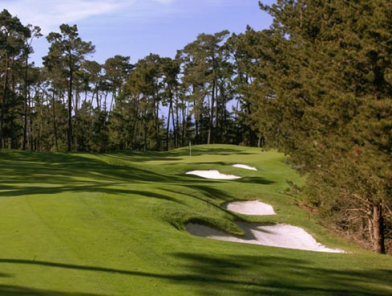 The course joins is owned by the Pebble Beach Company which includes among its other properties Pebble Beach, Spyglass Hill, and Spanish Bay. There have been only two major changes to the course design in its 100 plus years. In 1920 -21, Herbert Fowler re-routed the course adding bunkers and extending tees to take the course over the 6,000- yard mark and extending the 18th hole from a par 4 to a par 5. Highway 1 construction necessitated the other change with Del Monte's final routing in1971. Del Monte is not a long course (par-72, 6,357-yards), but don't let that mislead you to think it is an easy course. The challenges the golfer faces are typified on the second hole, a 328-yard par four. The drive must be a slight draw of no more than 225 yards. Any tee shot significantly shorter will leave the golfer blocked from the green any shot too long will find a bunker. The approach is played to a small, highly-sloped green where long is dead and short probably means the third shot will be from a bunker with very little green to work with. As with most greens on the course, the severe back-to-front slope makes two putting a challenge. Distance control determines your ability to score well at Del Monte. Get above the hole and you'll be chipping or putting downhill, which can be perilous. Many of the short par 4s at Del Monte (there are five less than 350 yards) follow this same advise: controlled tee shot that must be accurately placed followed by an approach to a highly contoured and tiny green. Par for the course is 72. From the back tees the course plays to 6,357 yards. From the forward tees the course measures 5,429 yards. The longest hole on the course is # 9, a par-5 that plays to 524 yards. The shortest hole on the course is # 12, a par-3 that plays to 163 yards from the back tees. Watch out for # 7, a 379 yard par-4 challenge and the #1 handicap hole on the course. The easiest hole is # 17, a 500 yard par-5. The course can get crowded. It gets about 44,000 rounds of play each year. Green fees range from $100 to a twilight rate of $25. 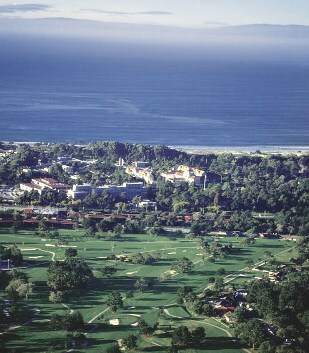 One of the better deals on the Peninsula is available to members of the Duke's Club at Del Monte. 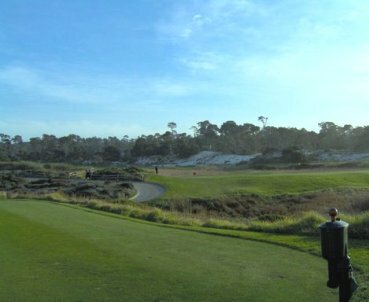 For the $250 membership fee, a golfer will pay discounted green fees ($37-$53) and reduced rates at Spyglass Hill and Spanish Bay. Plays longer than you think. Small hard greens. Little fringe, if you are not on the fringe, then very difficult to get up and down. This course gets into your blood. Doesn't seem like it should be hard, but it is. Makes you work and think. But little if no BS stuff that makes it impossible, like some resort courses. Good shots are rewarded. I've played #7 over 100 times (I used to live next to the course). After twenty years, finally parred it!! Usually in fantastic shape. Pros play this annually, and are annually humbled. Thought it very overpriced for what you get. Very boring Municipal style layout, not very challenging. Definitely not up the the Pebble Beach Company standards. I would rather have played Bayonet. If you're on vacation, I would play Bayonet or somewhere else for more money. You'll get more bang for your buck. If you're loaded and $80 is a drop in the bucket then this is a fun little course worth checking out, but if you're poor like me then spend the extra $20-$40 and play a much better course. Housing was too close to the course. The staff was very accommodating. Wife and I played in 3 1/4 hours starting at 8 50 am on Sunday, the last 7 holes in a fivesome with the three men we caught up to. The course was in good shape and the greens were excellent, true and fast. We were staying at the Hyatt, which is adjacent, so it was very convenient. Not much different from when I won a tournament there in 1973. I play this course 10 15 times a year and find it a joy. Although it is a bit short, it is challenging with the small greens. A great walking course, and it plays fast Sat early 3.5 to 4.0 hours. Fun to play, deceptively difficult. Greens currently very thick but springboardy. They do not hold even high spinning wedge shots. Putting speed is slow, uneven. Second cut and rough is usually overseeded. Course keeps removing more and more trees and shrubs, especially near tees where they used to protect from errant shots attempting to be hit to the previous green.